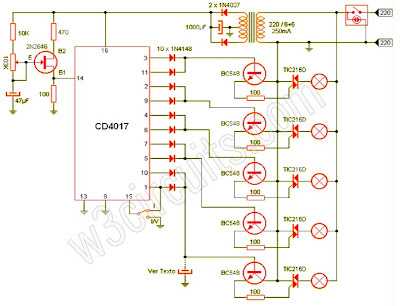 This circuit controls five 220V outputs which can be connected to each circuit of lights that will illuminate sequentially. By means of a potentiometer you can adjust the speed of movement and by means of a switch you can select the effect (one-way or round trip). 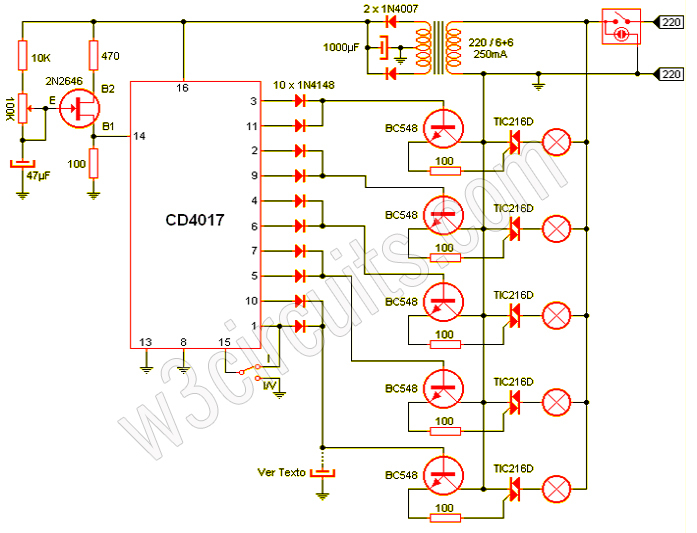 The circuit comprises a divider by 10, a transistor oscillator stage performance and power supply. Each pulse in the integrated leg 14 rotates in the terminals (the order is: 3, 2, 4, 7, 10, 1, 5, 6, 9, 11 - in that order - and then repeat) . If a pulse is applied in the integrated leg 15 resumes from terminal 3, so that the switch I, when the bill arrives at Terminal 1 restarts and when the switch is in the I / V the count is taken complete. 4148 The ten diodes make the current integrated just go to bases and back again when going back or leg. If capacitors are placed at the bases of the transistors of values ​​that can be around 47μF (this value must be experienced) achieves a smooth effect off (dimmer) very pleasing to the eye. The higher the value of these capacitors will stay on longer and softer channel will shutdown. This circuit works with living mass, which implies a serious risk of electric shock if you touch any electrical or electronic part. Take appropriate measures to isolate ALL tracks and cables as well as triacs and sinks. Even in the oscillator transistor and the integrated there 220Vac.